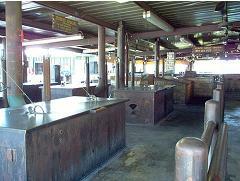 “Cowboy” style is the modern equivalent of original pit barbecue, wherein a steel or masonry box replaces a hole in the ground (the original pit). Cooking this way is a 2-stage process. In a separate retort, logs are first burned down to coals. The hot coals are then shoveled into pits. 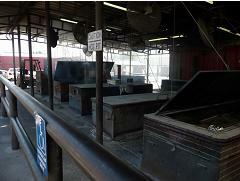 The coals are arranged on the floor of the pits, and cooking grates are two to three feet above the coal bed. 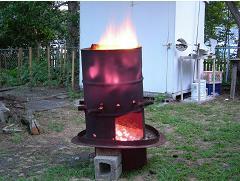 At first glance, Cowboy appears to be a Charcoal Cooker plus an on-site charcoal factory, but there are two important differences. The coals are not completely carbonized – they are still flaming as they are being transferred from the retort to the pit, so there are still aromatic volatiles present in them. The retort burning creates a fuel that is somewhere between wood and charcoal. Power and heat are controlled by shoveling (metering) fuel to the pit, which is a constant process that requires skill and experience. When cooking whole hog, for example, the pit boss will map his coal pattern to the carcass’ mass, ensuring that all the meat gets done at the same time. The pit may have doors and dampers to contain heat, but plenty of air is admitted for combustion. Cowboy cooking is a labor- and fuel-intensive way to barbecue. It lends itself to fixed installations. It produces some of the best barbecue in America. Temperature uniformity – being 100% manually-controlled, the uniformity is as even or uneven as the pit boss wants it to be. The distance from the coal bed to the meat ensures radiation heat transfer is low. Grease management – grease drips to the coal bed below where it burns as flame (evidence of excess combustion air). The drip distance ensures no hot flame reaches the meat. Airtightness – this is functionally unimportant in a Cowboy-style pit. Other – the smoke from the retort can get pretty nasty at times, and most fixed installations have a tall stack fitted to get it above people-level. The 2-stage process means the pit boss has to think further ahead to have the right coal supply ready for the pits.